Technology changes fast. Customer expectations change faster. They want faster service, new applications, and better communication. You need to scale operations at breakneck speed to keep up. Changing demand means I always have too much or too little storage and computing capacity. The Cloud is the key to success in this rapidly evolving landscape. It makes businesses more scalable, portable, and flexible. But upgrading your IT infrastructure is a major undertaking. With so many cloud options available, you might feel like you don’t know where to begin. I’m not sure if I should use a public, private, or hybrid cloud infrastructure. Once you migrate to the cloud, you’ve got a whole new set of cloud operations to manage and maintain. How can you know you’re using your cloud infrastructure to its maximum potential? The Cloud changed the way my IT department operates. I need help monitoring my data and managing applications. 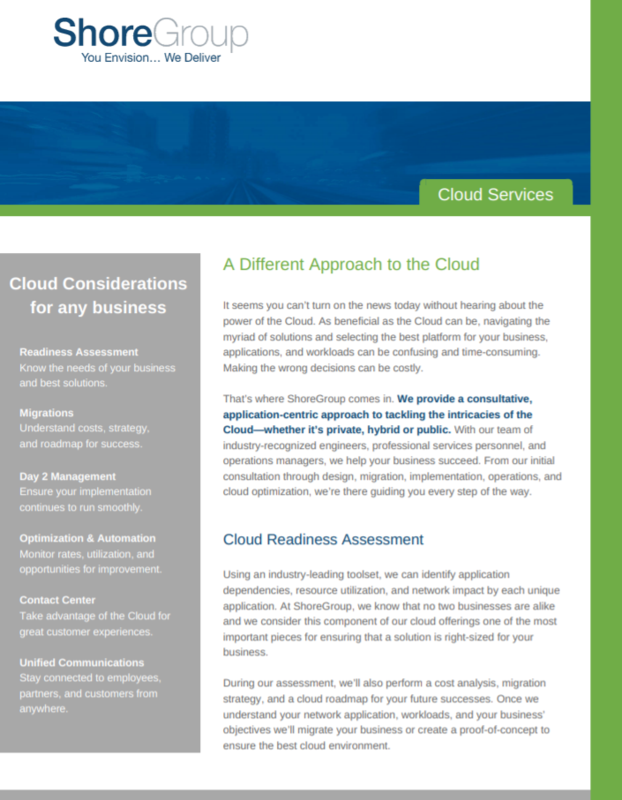 Read our Cloud Services brochure to learn how ShoreGroup provides a consultative, application-centric approach to help you tackle the intricacies of the Cloud and cloud-based contact center and unified communications applications. Using a consultative, application-centric approach, ShoreGroup designs, manages, and optimizes all kinds of cloud environments, including private, public, and hybrid. We take care of migrating, monitoring, and maximizing your data and applications, so you can focus on delighting your customers. When you work with ShoreGroup, you gain access to a team of industry-recognized engineers, professional services personnel, and operations managers. We’ll work with you to assess cloud readiness, migrate your operations to the Cloud, and optimize and automate cloud applications. Assessment, migration, management, optimization, and more. Keep employees, customers, and partners connected and working together. Move your contact center operations to a robust cloud environment.